Kashmir’s history and culture goes back to a very ancient period and this lovely land has absorbed many cultures and the present day blended cultures of Kashmir may be Buddhist, Shaivist and Islam at the same time. Kashmir is of great cultural interest to us because it was here that the Mahayana bloomed and traveled from this very land to China, Korea and then to Japan. It was through the efforts of the great Kashmiri Central Aisa. I need not deal with the activities of other Kashmiri scholars, like Gunavarman, who gave a new cultural life to Tibet. In fact, many a scholars of the world have written much about the actitivies of the Buddhist faith and culture in various lands. I am submitting all this all to show that Kashmir occupied a very important place in the history of Buddhism and it is for this very reason that Kanishka convened this council here. It is known to all that the Council, about which I am talking, was convened by Kanishka. He was known as Shaonanoshao Kaneshki Koshano. How these Kushanas came to Kashmir, is another story and I need not deal with this issue in detail. I will deal with it briefly. 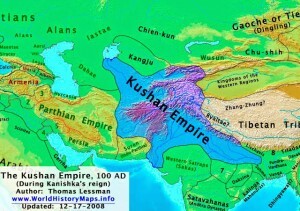 Kushanas belong to the Yuechi (Yueh-shih) tribe, which rose to power in about 162 B.C. and they lived in the Kansu province. But, their success was short-lived and their leader Chang-lun was defeated by Lao-Shang. They were vanquished and turned out to their homes in about 177 B.C. They fled towards Kipin or Kashmir. Later they occupied Afghaistan and were known as Kushanas. Historical as well as numismatic evidence has established that Kashmir formed a part of the great Kushana empire. With the coming of the Kushanas, Buddism received a tremendous impetus. There is no denying the fact that during their rule Buddhism enjoyed real patronage. Coins of Huska or Huviska and Kanishka have been located in Kashmir. Although, no numismatic evidence has come to light about Juskha, yet building of the town of Jushkapura (modern Zukur) has been attributed to him. 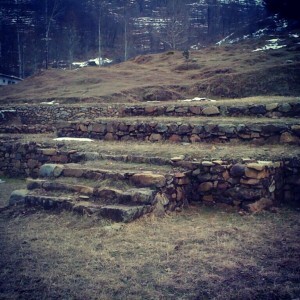 To Huska, the building of Husukpura (Ushkur) is attributed and in the same way Kanishka supposed to have founded Kanish-Kapur, now known as Kanispur. They are also said to have built many Buddist Viharas. Nagarjuna, who lived in ‘the wood of the six saints’, now known as Harwan, has been termed as Bodhisatva. Nagerjuna wa a person of great celebrity and scholarship. Kalhan has the following reference about him. You’ve managed a first class post.